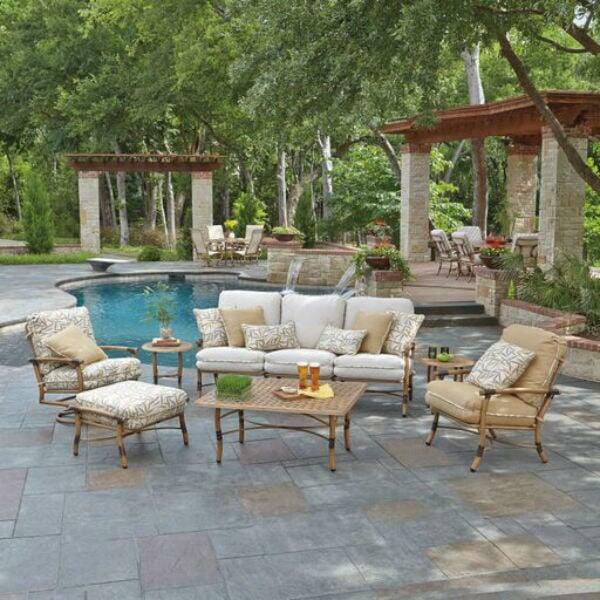 Glade Isle Deep Seating features a huge collection of surfaces and seating options. Like all of the Woodard collections, the arrangement is completely customizable by you. Each of the seats and surfaces is available individually, and all of them match perfectly. There are two different styles of deep seating seats in the Glade Isle selection. Some of the seats are made with cushions, and others are made with slings. The sling fabric is breathable, conforms to the shape of the body, and is easy to maintain. The cushion and cushion fabrics are made to withstand all weather types, and they are plush for an enveloping deep seat experience. The collection includes two types of surfaces, too. Some of the tables include both a base and a thatch tabletop. Other surfaces include a base that must be matched with a separate tabletop. Glade Isle furniture is made so that the finishing touches are in your hands. Browse the fabric and frame options, and select the best combination for your unique space!